I am happy to say that all seven offices in the new Gather Studios space are filled with a wonderful mix of tenants, each of which are business owners. I will hopefully post more about that (and them) at a later date but for now wanted to share about the grand opening and some of the makers that I will have popped up in the back garden. I have been spending the past few months upfitting the space and getting it geared up to host classes, events and to function as the showroom of the relaunching soon online shop. One of the key differences I was seeking out the most compared to the other Gather spaces was a private office for myself, outdoor and bigger classroom space again, a focus again on community and shared spaces, and a showroom versus an open all the time retail store. I have achieved that with the new space and it feels like I’ve landed on the winning solution after years of editing and refining and of course a year long break to figure out what I really wanted. I also adore being in what feels like a small town where I can walk from my home to here and be a part of a close-knit community but also very close to Raleigh as well. It feels like now is as good a time as any to host a grand opening event to celebrate this special space, and it lights a fire under me to wrap up a lot of the open ended projects that I’ve been working on non-stop in getting a space up and running again. There are so.many.details. and I seem to always forget that, rose colored glasses and all, but the effort is always worth it in the end, when the space comes to life and functions as I’ve envisioned it and feels like a cozy, serene and inspiring spot for myself and others to interact with and work out of. To celebrate on Thursday July 19th from 7-9pm I am hosting a maker pop up in the back garden featuring a handful of talented makers, The Humble Pig food truck will be here, Pharmacy Bottle & Beverage will be serving beer and wine, there will be live music and everything in the showroom (lots of new items for the relaunching that day online shop) will be 20% off. Fun! The new space is located at 417 Kildaire Farm Road, downtown Cary, NC 27511. There is a big parking lot across the street for the Cary Arts Center as well as Cary Elementary and this is where I would encourage you to park. You can find more information at the facebook invitation here. Derek Keller of 440 Gentleman Supply makes handmade leather goods like bags, wallets and other accessories from his garage studio in Raleigh. Everything he makes is hand cut, sewn and produced by him and is inspired by modern architecture and vintage motorcycles and gear. He learned how to craft from his parents and recently took his craft full-time. Liz Esser of Haden Designs in Raleigh specializes in brass and leather jewelry and seeks to create pieces that give that feeling of unique beauty to their wearer. Some of her newest pieces combine intricate metal patterns and textile weaving and all are in lovely muted shades that are reminiscent of autumn. Erica Gimson is a textile designer with 20 years of experience creating home accessories for multiple Fortune 500 companies. She now makes her home in Raleigh where she designs her own pieces which start from hand drawn sketches. She is inspired by the idea of giving people the tools to create a life that they love. Raleigh, NC based furniture maker Matt Booty of Enkle Designs has lived in South Africa, Seattle, Greensboro and Raleigh and brings that well-traveled perspective to his work, drawing particular inspiration from Scandinavia. Specializing in handmade furniture and home accessories, Enkle Designs makes each piece by hand and places a high value on sustainable materials. Raleigh, NC potter Liz Kelly’s ceramic work is inspired by traditional craft and contemporary design. She makes functional home goods that are both earthy and elegant. Her time studying at NC State’s College of Design has given her a unique perspective rooted in the craft origins of design. Adam Davis Furniture specializes in handmade wooden furniture and unique wooden accessories and is based in Raleigh. I first met Ana Maria Munoz at my Gather shop in downtown Cary three or four years ago. I was behind the counter slinging coffee and she was a customer, it was Small Business Saturday and she carried one of the totes that we were handing out free in honor of the event. And while Ana Maria was warm and engaging, the thing I noticed most about her was her sense of personal style. She had an “otherness” about her wardrobe that didn’t feel like it was native to the area. It felt more European and urban than things I was used to seeing around here – in a good way. Flash forward to now and Ana Maria is just about to celebrate the second anniversary of her own store, Port of Raleigh in downtown Raleigh. This Saturday too is Small Business Saturday so it seems fitting to post about her shop now, though I’ve been wanting to do so for a long time. The thing that sets her shop apart is the same thing that I noticed with her wardrobe, it is impeccably curated with a modern, European/traveled flair that is literally unlike anything in the Triangle area. Located in a new construction building in downtown Raleigh with big glass windows, pops of her signature industrial yellow on the walls, and polished concrete floors, Port of Raleigh is steps away from Poole’s (the best mac and cheese you’ll ever try) and the convention center. Inside you’ll find modern home goods, most of which are imported, think Japanese paper products and Danish metal accessories, but also goods from right here. She fosters and sells the work of a local furniture design company Flitch Furniture, and regularly features the work of local makers and NC State design school students in her First Friday events, all within the lens of modern home goods. Recently her shop was featured on the very popular design blog, designmilk, and rightfully so. I have been fortunate to travel abroad to many countries as well as cities around the U.S. and my favorite pastime is exploring the shops. I am fascinated by how others merchandise their goods, the products they feature, the trends and patterns, the colors and layout of the shop. It is an absolute passion, nay obsession, and I have the pictures to prove it. You can shop in person at Port of Raleigh Wed-Sat from 11am-7pm& Sun 12pm-5pm, at her online shop, and you can follow her on instagram. Expect to see her adorable daughter Hazel sweeping the front entry, her husband, towering above them both, adjusting window displays and of course Ana Maria and her merchandise picks. Port of Raleigh is located at 416 S McDowell Street, Raleigh, NC 27601. Photography by Michelle Smith for Gather Goods Co.
Olympia is a freelance marketing and communications manager who works as a consultant for various companies. She is also the founder of Dame Good 365, an online community of women connecting and finding inspiration to do good in their communities. Her passion is in giving back and working at the intersection of digital communications, social media, brand development, and public relations. Obviously, because of her skills and expertise, she knows, like me, the value of having an updated and professional headshot and I was thrilled when she asked me to shoot hers recently. Currently, Olympia is living in a small apartment with her husband and other family members so her home office doesn’t have the professional look she wants to convey in her professional life. I scouted out a few locations before deciding to shoot at NC State’s super sleek new library, the James B. Hunt library located on Centennial Campus. It is a cool spot, not only because the books are pulled from the shelves by robots, but more importantly, because of it’s floor to ceiling windows on every floor, varied backdrops and work surfaces. First impressions count and when you are pitching yourself to potential clients or seeking job opportunities, your photo is one of the first things that person hiring or buying from you sees. Olympia will be using these new headshot photos across her social media platforms and I’m confident they will help her garner more work and continue to position herself as an expert in her field. Thanks Olympia for working with me! 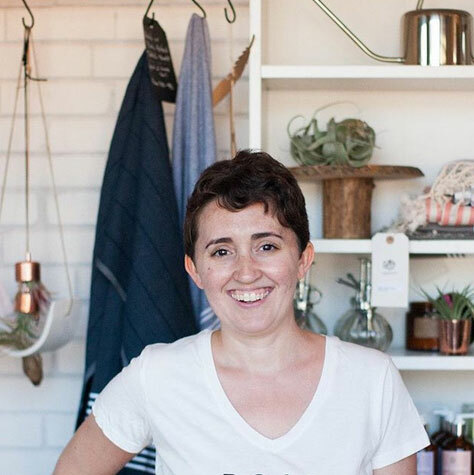 Gather Goods Co is a tiny gift shop, classroom and online store focused on showcasing beautiful goods, many of which are made by emerging makers. We also have our own line of gift and garden products under the same name. Gather-Studio is our service arm focused on photography, styling, social media, marketing, branding and design work for clients. Interested in our services? Email me for more details.